Polymers can displace traditional materials in the most unlikely places. 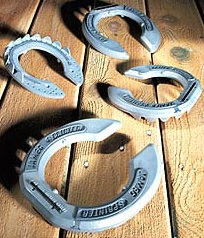 A polymer horseshoe (for the forelegs of racing horses) has been designed, patented and developed by Jameg Horseshoes of Barnby Moor, North Lincolnshire, UK. As with many product substitutions the polymer substitute exhibits far superior benefits than the traditional material, in this case steel or aluminium plates. The horseshoe is a two shot injection moulding using PA6.6 from Vitamide Jackdaw, the VTC UK nylon compounder, and thermoplastic elastomer compound (TPE) from VTC's Swedish compounder VTC Elastoteknik. In addition to the two polymer compounds the shoe contains a small steel strip, which is assembled in mould. The new horseshoe, the Jameg Sprinter, is adhered to the horse hoof with an acrylic based adhesive, which means that the shoes does not need traditional hoof nails. This is important because driving nails into horses hooves limits the number of times the animal may be re-shod and in the case of racehorses this impacts upon the number of races in which the horse can compete. Most importantly the nylon base of the Jameg Sprinter produces not just strength but flexibility which works in harmony with the horses hoof, while the TPE gives grip and shock absorption. The Jameg Sprinter, when fixed, effectively becomes part of the horse's hoof allowing it to expand and contract in naturally. In addition to racehorses, the Sprinter can be fitted with studs and used on horses involved in almost any discipline. They are less likely than steel shoes to cause injury to a fallen rider, they are ideal for brood mares, horses at rest, those recovering from laminitis and horses with poor or badly broken feet. The Sprinter was designed, patented and developed by Jameg Horseshoes of Barnby Moor, North Lincolnshire, with substantial development assistance from Senior and Dickson who turned to VTC for advice on polymers and compounds. "We needed to undertake a lot of development work." said Senior & Dickson Managing Director Geoff Dickson. "After all a two-shot moulding with a steel in-mould insert is fairly complex and I wouldn't like to say how many versions we went through before we had a workable product. Vita Thermoplastic Compounds have been more help than any supplier I can recall. Malcolm Lowe of Jackdaw and Martin Bradbury of the TPE Group, were tireless in their assistance."